Some of the very best dystopian books set in the future have wildly Divergent (see what I did there?) views of what a world gone bad looks like. Some emphasize a retreat into an immersive all-encompassing video game a la Ready Player One (image credit above), others the squalor of urban survival, and yet others give off a woodsy, survivalist vibe, adding a Man vs Nature layer to the Man vs Power/Government trope so common (essential?) to the dystopian genre. In Meritropolis everyone is assigned a numerical Score that decides their worth to society and whether they live or die. After a young boy is killed because of a low Score, his brother plots to take down the System. 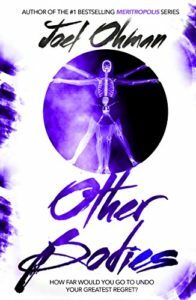 With my newest book, Other Bodies—yes, it’s also dystopian, and yes, it’s also set in the future, but it’s much more of a futuristic dystopian novel in that it imagines a world, set in a futuristic Philadelphia, where immersive VR experiences and cutting edge medical technology blur the lines between body and bot, what’s living and what’s not. NEW RELEASE – PRE-ORDER NOW FOR JUST 99 CENTS! So, all that to say, I thought it would be fun to have a look through some lists of the top futuristic dystopian books, primarily young adult, and see how many of them I have read, and also get some new ideas for books to read! I started with this shelf of popular futuristic dystopian books over on GoodReads, and figured out that I’ve read 18 books out of the top 100. Divergent Trilogy (Veronica Roth) – If you’ve seen the movie, do yourself a favor and read the books. Here, the adage holds true: the books are much better than the movie. The setting is a futuristic Chicago and could almost be a character in its own right. Enjoy this futuristic dystopian tale for the world-building as much as the interplay between the characters. The Hunger Games Trilogy (Suzanne Collins) – In this already classic of the genre, the movies are on par with the quality of the books so go ahead and enjoy them both! What else remains to be said about this mega bestseller? Unwind Dystology (Neal Shusterman) – If you like reading books in the YA genre with non-stop action that simultaneously makes you wrestle with complex philosophical issues then look no further. I have no problem recommending Shusterman to many of my readers who love my books for many of these same reasons. The Fifth Wave Trilogy (Rick Yancey) – When trouble happens, it comes in waves… First plot point: bad stuff happens. Second plot point: even worse stuff happens. Third plot point: the worst stuff happens. Fourth, fifth—well, you get the idea. This was a fun read – lots of time travel paradox/grandfather paradox type stuff going on for pretty much the entire book, so if you want some mind bendy good fun, then this is the book for you! In addition to the unique time travel elements, where the author makes it a point to embrace the paradoxes, he also employs some interesting cross cutting techniques where the A-story is squarely set in the coming of age fantasy genre, with all of the familiar tropes of the form, and the B-story is squarely set in the sci-fi space opera genre, so when the A-story and the B-story collide, as any good cross cutting storytelling setup inevitably does, it’s a clever little bit of alchemy, both from a plot perspective, but more notably from a genre perspective, to see what he end result is. There were some slow points, but overall, this was a fun book to read, and likely a nightmare to try and edit/check for consistency. If you find yourself getting lost in some of the alternate timelines and timehopping; just enjoy the ride, and join the club! Ready Player One (Ernest Cline) – I didn’t even play many video games as a kid, and even I got some of the nostalgia the author is squarely going for in here. An all around fun book. The rest of the books I’ve read from the list are your more “middle-brow” futuristic dystopian, one that could even be termed “literary futuristic dystopian”. Didn’t think that was a thing? Yep! Call it “the best dystopian novels for adults” if you’d like. T he Handmaid’s Tale (Margaret Atwood) – Come on, don’t tell me you’ve only watched the TV show? For fuller commentary, read my article at the link above, but suffice to say, this is a book that has a point to make—and whether you agree with the author’s point, or not (not), it’s hard to deny the power of a book that doesn’t shy away from theme. The Circle (Dave Eggers) – I’ve had this book in my Kindle queue for quite some time, because it seems uniquely suited for me, if not for my reading tastes, at least for the career choices I’ve made: dystopian fiction author and serial entrepreneur/software company founder. Now it’s your turn. What are your best futuristic dystopian book recommendations?